QDR Cares and we know you do too! Together, with the healing power of country music, we can help change and rebuild lives. Join us for an amazing night of country music benefiting victims of Hurricane Florence. Join us at the Lincoln Theatre on Tuesday, November 20th for QDR’s “Concert for Carolina” featuring David Lee Murphy, Parmalee, Brandon Lay and our local “Voice,” Britton Buchanan! 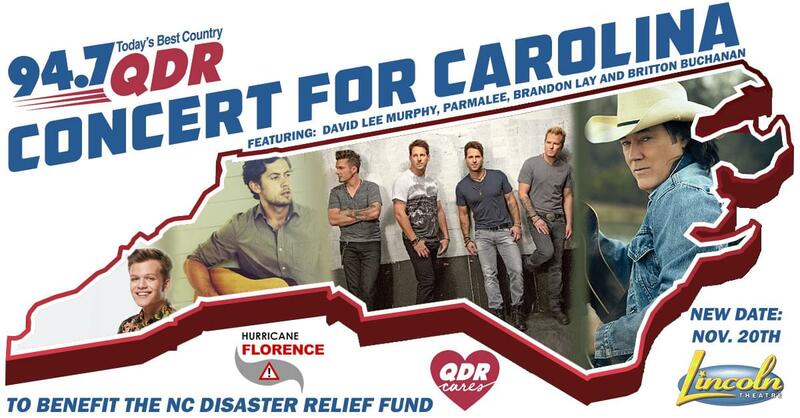 In addition to a great show, we’ll be raffling off items for Hurricane Relief including autographed guitars from Luke Bryan and Kenny Chesney, and a trip to see Eric Church on his 2019 Double Down tour. 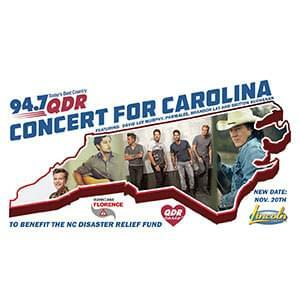 100% of all proceeds from this show benefits the NC Disaster Relief Fund which directly helps hurricane victims. Cost: $20 General Admission or $45 VIP (includes Meet & Greet) via e-tix.com. On sale Friday, October 5th at 10am. Buy tickets to all of our #QDRCares shows and SAVE!